Special Summon any number of monsters with different names from your hand and/or GY, in Defense Position, that are all “Neo-Spacian” monsters or “Elemental HERO Neos”, but negate their effects, and as long as you control any of those Special Summoned monsters face-up, you cannot Special Summon monsters from the Extra Deck, except Fusion Monsters. You can only activate 1 “NEXT” per turn. If you control no cards, you can activate this card from your hand. Happy Monday! NEXT is an interesting Normal Trap Card that can only be activated once per turn but has no cost. You can even activate it from your hand if you control no cards. Hopefully you have a bunch of Neo-Spacian or Elemental HERO Neos in your hand or grave so you can Special Summon any number of them in Def mode and without their effects. They also all have to have different names and then you can’t Special Summon from the Extra Deck while any of them are face-up except Fusion Monsters. Obviously, this sets up contact fusion or any number of fusion spell cards. I would point out that you can Normal Summon something big or Tribute them for effects. The Fusion Monsters don’t have to be HERO or Spacian. For instance, if you can make them all Spellcasters, go into Quintet Magician. Dragons could go into FGD. There are going to be ways to utilize this card and NEXT is the next best thing to Soul Charge. Well you never know what archetypes will get support in this game, and in 2018/2019 we finally saw some Neo-Spacian support to help boost the archetype into making it an actually somewhat playable deck, so we are looking at those cards this week, starting with NEXT. 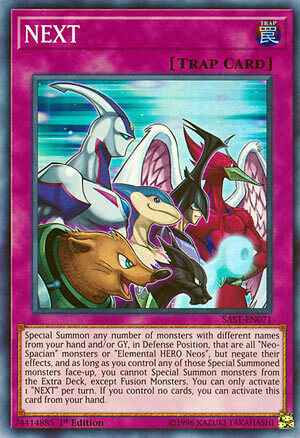 NEXT is a Normal Trap that upon activation lets you Special Summon any number of Neo-Spacian monsters with different names and/or Elemental HERO Neos (only one) from your hand or graveyard, but negate their effects and while you control them, you cannot Special Summon from the Extra Deck except Fusion Monsters while you control any of the monsters summoned off this effect and it should be noted that if you control no cards, you can activate this from your hand and you can only activate one NEXT per turn. The name would of made me think they were finishing the NEX series that never really finished, but thankfully they didn’t go back to that gimmick. This helps give you good defense when need be and sets up a Contact Fusion with great ease. The effect negation kinda stings as none of the effects of the Neo-Spacians are particularly that great and Elemental HERO Neos is just a Normal Monster, but I guess no discarding from your opponent’s hand with Aqua Dolphin, no life point gain with Air Hummingbird, or no bouncing a monster to the hand with Grand Mole, just to name a few Neo-Spacian effects. It being able to be activated from the hand is nice on the first turn of the duel to get that quick Contact Fusion once again, even though they go back to the Extra Deck at the end of the turn unless you got the cards to prevent that, but setting up a Nebula Neos after your opponent invested a lot of resources into their board might be nice, and it could help summon the card we’ll finish the week with. The Extra Deck restriction to Fusions while you control is necessary to prevent Link Spam in a deck they don’t want Link Spam in. Overall, NEXT offers good defense and a quick Contact Fusion setup, and those restrictions prevent this from being too broken, so a few copies in a Neos deck would be nice. Art: 4.5/5 The gang’s back together! Austin told me about the weeks upcoming (we’re booked until 2099, that’s not a typo) and this is honestly a week I’m pretty excited about. It’s Neos week y’all, and the Trap NEXT opens things up. So, we immediately see swarm potential, which is good, in this card. We also discover swarm can happen from your Hand and/or Graveyard, so we like the versatility involved too. You’r allowed to Special Summon as many Neo-Spacians or an Elemental Hero Neos Monster from either location(s) as possible. But not of both types, just keep that in mind. They are Special Summoned in Defense position and have their effects negated, which isn’t much of an issue. Neos has no effect, and you’re likely setting up for a big play/Fusion anyway, so the Neo-Spacian effects being lost is mostly irrelevant. I really like that these Monsters don’t come with an attached ‘destroyed during the End Phase’ clause. You’re prevented from using more than one of these a turn, and you can’t perform Extra Deck Summons outside of Fusion, but for a Hero player, that’s less than no problem, especially just in the turn. It’s an added bonus you can play this from your Hand if you control no cars. In short…it’s good, it’s not GREAT, but it’s good enough to warrant a one of in your Deck, and should only get to be a better Draw the further you get into a game. Art: 4/5 Not very inspiring, but it’s nice to see the crew together.